Web 2.0 technology has transformed the Web into a core business communication platform. Unfortunately, it’s also become much easier to accidentally or intentionally disclose sensitive data. 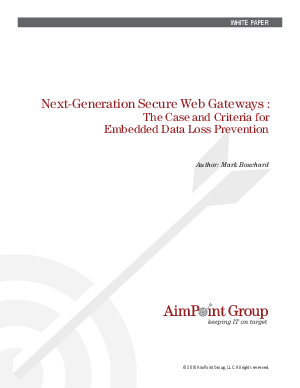 This white paper outlines the business need for Web data loss prevention (DLP), makes the case for DLP as an embedded capability within secure Web gateways, and defines what customers should look for in a solution. Register to access a complimentary copy of this AimPoint Group white paper.